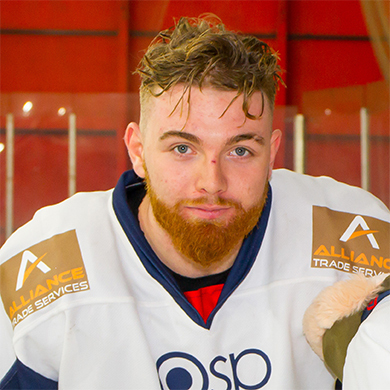 Brandon Miles’ hockey journey began in Slough and has since taken him to Bracknell, London, Streatham and now the Dynamos. Having risen through the ranks in Berkshire, he made his senior debut for the Jets in 2012/13 aged just 16 where he appeared in 19 games for the EPL side as well as 16 for their NIHL South team. He continued to feature in both line-ups the following term – this time making 31 EPL outings and claiming his first EPL goal whilst becoming a force to be reckoned with in the NIHL South Division 2 with 18 strikes and 16 assists for 34 points in 23 games. In 2014/15 Brandon Miles was signed by Streatham in the NIHL South’s top tier and here he managed 8 points in 16 appearances for the Londoners before finishing the campaign with 9 points in 8 games back with the Slough Jets of the second division. A move to Bracknell followed in 2015/16 where he iced 31 times with the Hornets in the NIHL South Division 1 and scored 12 goals, claimed 5 assists and so amassed 17 points. He also embraced the physical side of the game and showed a willingness to drop the gloves resulting in 138 minutes of penalties. His performances saw him called up to represent the Bees 6 times in the EPL. Brandon Miles remained with Bracknell for the start of 2016/17 but switched to the London Raiders in December and ended his season with Lee Valley based side. He played a total of 35 games across all competitions and managed 16 points with 8 goals and as many assists. In 2017/18 Streatham then re-signed the man that had last worn their jersey in 2015 and here he was deployed largely as an enforcer – piling up 184 penalty minutes in 34 games for the South London team whilst also tallying 4 goals and 2 assists. Now the strong forward will be looking to add both points and muscle to the Dynamos line-up having signed a contract in Gillingham for the 2018/19 campaign.